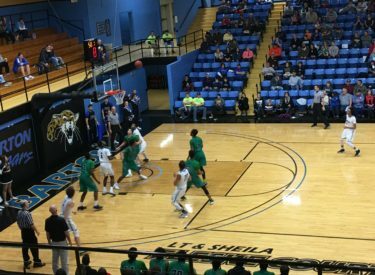 Seward allowed 100 or more for a third time this season in a 108-95 loss at Barton Saturday night. The Saints drop their sixth consecutive game. Like Wednesday in Concordia, the Saints were competitive in the first half only to see their opponents light up the gym in the second half. Seward led by as many as four in the first half and the Cougars led 45-42 at the half. But Barton made 9-11 three pointers in the second half to blow the game open. Barton outscored the Saints 63-53 in the second half. The Saints shot 44 percent while Barton shot 57 percent and mad 58 percent (15-26) of their three’s. The Saints were 12-22 from three point land in the loss. Barton maded 31-40 free throws and Seward was 29-35 at the line. The Cougars out rebounded the Saints 38-30. The Saints only turned the ball over nine times in the loss. Kevin Sims scored 32 on 9-18 shooting to lead the Saints. Charles Beauregard had 19 points and nine rebounds. Pierre Johnson had 11 points with four assists. Seward falls to 6-15 overall and 3-14 in the KJCCC. Barton is tied for second with Dodge City at 12-5 in the KJCCC and 16-5 overall. Seward hosts Pratt Wednesday night at 8 in the Green House on 107.5 and kscbnews.net. First National Bank is the buyout sponsor.